The BOSS G15/G21 vs BigFoot LHR15/LHR21 MK II – which is right for you? This is very much a Ford vs Chevy kind of scenario. Both machines are very formidable long throw polishers. They will both get the same job done. Which one is better is really a matter of personal preference. Though, all hope is not lost in your quest to find the right one. There are a few details about each polisher that may help sway your decision. Let’s look at a comparison of the two. Is the Griot’s Garage The Boss G15/G21 right for you? Is the Rupes BigFoot LHR15/LHR21 Mark II right for you? As you can see, both polishers are 15mm long throw orbital polishers. They were both designed as part of a system that includes specific pads and polishes. They both have a max speed north of 5000 orbits per minutes. They both have ergonomics similar to that of a rotary or angle grinder with the long body, pistol grip, trigger switch, trigger lock, and optional over top or side mounted handles. So what then are the details that may make one better than the other? If you’re still having trouble deciding lets break it down. See what I mean? On the surface it seems like an Apples to Apples comparison but there are some important differences that many people may care about. When I made my choice I picked the Griot’s Garage The Boss G15. 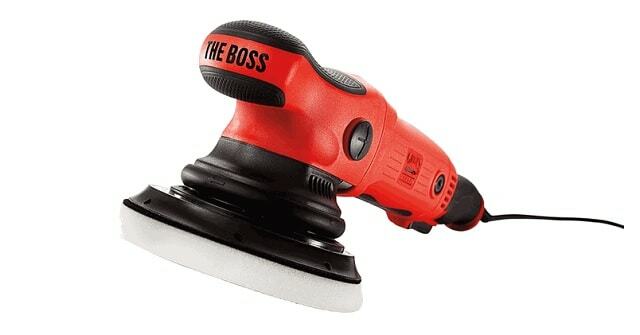 Though the polisher is made in China it was very thoughtfully designed with good Japanese bearings, includes replaceable brushes, and has a no-BS lifetime warranty against defects. Griot’s Garage is known for standing behind their warranty and failures of their tools aren’t common. I also prefer the ergonomics of The Boss’s rubber coated hand holds and grips. I can live with the tool being a little heavier and not having as prominent of a tool rest molded into the top. Regardless of which polisher you choose, understand that these are both part of a carefully thought out system that includes pads and polishes designed to work in concert with the machines. While you can run any pad and any polish you want with great results you’ll get the best and most fool proof experience using the pads and polishes that are also part of the same system. I encourage you to look for package deals like these that include all parts of the system to both save money and have the best experience. Still not sure either of these are right for you? Click here to download my FREE guide to filter and sort over 40 different polishers!